Revision 8969 of JOSM has introduced a new behaviour. When the user splits a way, it prompts the user to choose the part of the way that should inherit the history. Mapbox published a map indicating the lack of footpaths parallel to roads. 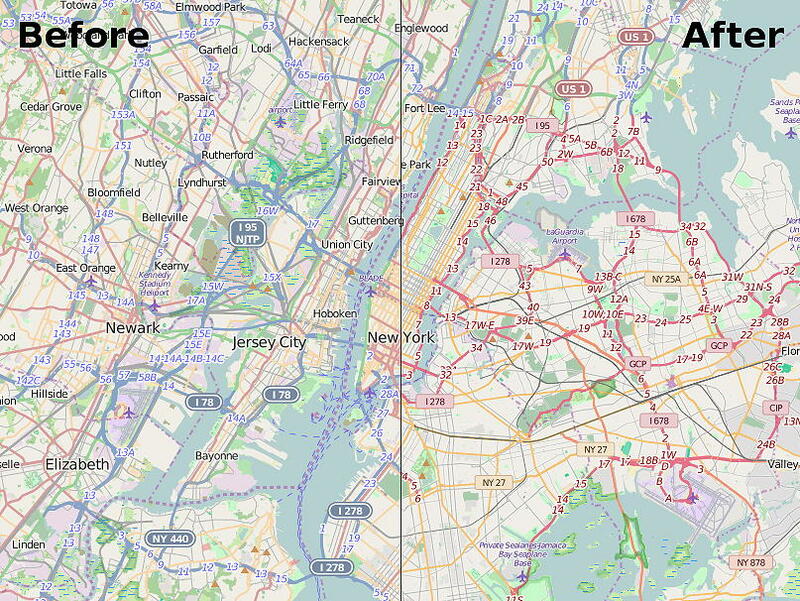 There is also a blog post and two Mapbox Github issues with more information. The source code of the project is public. Martijn van Excel writes a blog about the new JOSM plugin that is used to fix missing and wrong one-way streets. Just after the month of it’s release, 20% of the missing road tiles have already been resolved. Pierre Béland has created the NoFeature-style for JOSM. It is used to highlight objects that have no “major tag” to relate itself to an OSM feature such as highway, building, natural, landuse, amenity, etc. Karussell (the developer of GraphHopper) raised the problem of parsing units in OpenStreetMap tags such as maxweight, etc. Many comments and suggestions regarding this have been posted in his diary. escada’s diary “A Mapper in the Spotlight:Clifford Snow”, shares Clifford Snow’s experience in OSM mapping and also discusses about his achievements and contributions to OSM. Here is Clifford’s heat map. bdiscoe shares his ideas for making a better heat-map for highlighting the contributions of the mappers. Belgian mapper of the Month: Olivier Roussel. Here escada writes about Oliver’s contributions and experience with OpenStreetMap. Joost Schouppe shares his three week road trip experience with Mapillary. Open geo interview with Gregory Marler (aka Living with Dragons), the man who almost single-handedly mapped Durham, England in OpenStreetMap. Andy Allan in his blog, points out that most developers contribute to the OSM project for less than a year (similar to the pattern that is observed amongst mappers). The planning (English) for Chemnitz Linux Days (Chemnitzer Linux-Tage), which is to be held on 19th and 20th of March 2016 has started.. There is also a call for presentations for the same. Camilla Mahon reported in her Mapbox blog, that Mapbox worked with DigitalGlobe to get the up-to-date satellite imagery for the earthquake effected areas in Eastern Afghanistan. Mikel Maron writes in his blog about the participation of Mapbox’s data team co-led by Maning Sambale in the local HOT activities. The Daily Utah Chronicle reports about geography students participating at Hurricane Patricia crisis response mapping. See also a blogpost by Mapbox about the hurricane and the related HOT activities, and also this report in the Salt Lake Tribune, which also covers the Afghanistan earthquake response. In a video presentation, Mikel Maron outlines the key events and discussions in the evolution of HOT from 2005-2010. User “dekstop” tries to quantify HOT participation inequality. It’s complicated! OpenRailwayMap now visualises a significant number of Austrian railway signals. OSM Carto 2.36.0 was released and has been used since October 30th at OSMF’s tile-servers, which provide the tiles at osm.org. The new colour scheme was developed during the Google Summer of Code by Mateusz Konieczny. One very notable change will be the new colour style of the highways. See also the posting at OSMF blog, the mailing lists Talk, Talk-de (English) and at the German forum (English). Some of the discussion at Talk-gb is about creating a tile-server serving tiles with the old colour scheme. Richard Fairhurst notes that actually maintaining such a tile-server (supporting a layer displayed at OpenStreetMap.org) would need a lot of time and effort. Within the framework of “Arriving in Berlin” four refugees and residents at the Haus Leo (English) created a Map of Berlin for newcomers with contact points of helping organizations, offices, doctors, free Wi-Fi and police. The project coordinator, Ralf Rebmann, says: “This mapping project, which was implemented with uMap, is a collaboration between the Berliner Stadtmission and the Haus der Kulturen der Welt and it would not have been possible in this form without OpenStreetMap . The city administration of Wroclaw, Poland, released some oblique aerial photos as a basis for 3D mapping. See also this thread in the Polish forum (English). Adam Horan asks on the talk-au mailing list whether the “Victoria: Parks and Conservation Reserves” data from the Australian State of Victoria was appropriately licensed for it to be used in OSM. Due to conflicting information in the portal and in the data, no clear answer could be given quickly. Mikel Maron reports in his Mapbox blog, that the US Government is “advancing” into the direction of Open Data (pdf). weeklyOSM says: Happy 3rd anniversary Wikidata!. OpenGIS.ch is crowdfunding a QGIS 2.5D rendering. It still needs about 4.500 €, ~5.000 US$, ~3.200 Ł. Based on the Graphhopper routing engine, a new API for route optimization is available, so far in beta testing status. The navigation app “EB Dirigo” from Elektrobit is now downloadable as an apk download (English) and on Google Play. The app is “free”, but not “Free”. Simon Poole forked the JOSM standard template and added other often used tags, amongst other things, amenity=social_facility. This template is also being used in Vespucci. BRouter version 1.3.2 was released on November 1st, 2015 . The Node.js module csvgeocode can convert lists of geographical coordinates into an address list. Services like Google, Mapbox, OSM Nominatim, Mappen or Texas A & M’s can be used as backends. Yuri Astrakhan asks on the dev mailing list about the use of vector tiles and triggers a discussion well worth reading. SQLite version 3.9.2 was released on November 2nd, 2015. TobWen raises an issue about the rendering of Mapnik 3 compared with its predecessor Mapnik 2.x. Do be careful with the choice of the names for your variables! Dave Hansen regularly creates “Whole US” Garmin map downloads optimised by location, level of detail and the size of the memory card you’re using. Dave informs the talk-us mailing list when updates are available. The notification contains the download details and a short FAQ. Mapillary’s users have uploaded photos for one million kilometres. Conversions into miles and light years in the blog. Brian Timoney talks about 5 Mapping Industry Trends at JS.Geo. Spatially Adjusted reports: Apple Gets Ready to Release Indoor Positioning Service. Google celebrated the 200th birthday of George Boole with a “Google Doodle“; OpenStreetMap added a lasting gift. Ziltoidium researched the location via Wikipedia and added a note. Independently, Vincent de Phily added the buildings with his local knowledge. Nice example for co-working to improve OSM!